The new Mazda 3 Hatchback is probably the brand’s suavest-looking car yet. It’s handsome, great fun to drive, and affordable to run. It’s perfect for stylish families who want to keep costs down. A prominent front grille and slender headlights add a touch of sharpness to the way it looks, while the direct steering give it handling prowess. Even better, the manual gearbox is an absolutely joy. OSV takes a closer look at what it’s all about with our 2017 Mazda 3 Hatchback review. Family hatchback’s that are great to drive are few and far between. On such shortlists, the Ford Focus is a mainstay. From now on, you can start adding the Mazda 3. Its steering is direct and, there is lots of grip, and its manual transmission is awesome. It all adds up to a sporty driving experience, the relevance of which won’t be lost on drivers who have to step up to family cars and put their beloved hot-hatch years behind them. It’s agile in bends and urban sprawls, but also composed at motorway speeds. 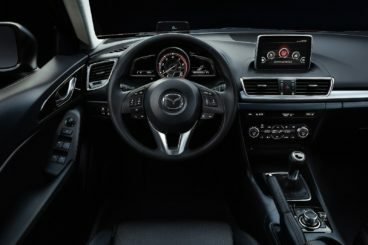 Yet despite its sporty prowess, the Mazda 3 also offers a comfortable ride, soaking up bumps and lumps with ease. Nice touches behind the wheel include bright controls and a thick-rimmed steering wheel. In terms of the engines, we’re finding it hard to look past the 2.2-litre SKYACTIV diesel engine. This tops the range, and can blast its way from a standstill to 62mph in 8.1 seconds. Importantly – and like with all the Mazda 3 models – it comes with strong brakes. A 1.5-litre 103bhp variant is your other diesel option. It requires you to work it harder, and takes a more leisurely 11.0 seconds to do the 0-62 dash. It’s refined and quiet, but it isn’t any more economically viable than the bigger diesel. There is also a 2.0-litre petrol engine available, which comes in two power guises. The 118bhp model does 0-62 in 8.9 seconds, while the 163bhp does the same sprint in 8.2 seconds. And because the former is much cheaper and hardly much slower than the bigger engine, it’s the one we’d recommend. The 163bhp petrol variant is actually the only engine in the range that can’t be paired up with the automatic ‘box. It’s hardly a bad thing, as the manual transmission is much slicker and smoother. The car’s sophisticated exterior should give it away. Just in case it doesn’t, the interior is equally classy. It’s smartly appointed, well-built, and can give even the likes of a BMW Hatchback a run for its money. It’s easy to get comfortable inside too, thanks to a steering wheel that adjusts for reach and height, as well as an adjustable driver’s seat. Sound insulation is decent too, but not best in class. The dashboard looks a lot better than it used to. There’s a genuinely upmarket feel here, as well as a sense of occasion. The buttons are clearly laid out and easy to use, with our only concern being durability. Compared to the likes of a BMW, we’re not sure how long the dials and buttons will last before showing signs of wear and tear. It’s fairly practical, though. Legroom in particular is generous, and even taller adults will be comfortable enough. However, it does pay the price for its bold design, with the smaller back windows creating a sense of claustrophobia. And while four adults can squeeze in, interior space is not as strong as it is in some rivals. The boot measures 350-litres, which is bigger than some but smaller than other competitors. We think it’s a reasonable size, but it’s disappointing that it misses out on a few handy touches. For example, it would have benefited from a 12v power supply or even shopping bag hooks. Standard equipment is decent across the range. All models get cruise control, the brand’s new infotainment system, alloys, and all-round electric windows. However, the entry-level model misses out on sat nav. The SE-L model adds rear parking sensors, the sat nav, and LED daytime running lights. The Sport Novel tops the range with bigger 18” alloys, a Bose stereo, rear and front parking sensors, and a heads-up display. Where safety is concerned, the Mazda has no issues to speak of. It scored 5/5 when crash tested by Euro NCAP, and its standard safety kit includes traction stability control and airbag’s. Automatic headlights and emergency braking are useful optional extras. Prices for the new car start out from around £18,000 and rise to £24,700. For more information on our leasing deals, check out our page here. In terms of its running costs, fuel economy is decent and competitive with its rivals. The smallest 2.0-litre petrol engine returns 55mpg at best, while the 163bhp variant is good for almost 49mpg. Both models demand a £140 yearly tax bill. The diesel engines represent the biggest savings, though. The 1.5-litre averages 74.3mpg economy, and costs nothing to tax. For anyone who wants more power, the 2.2-litre diesel can return close to 69mpg and emits just 107g/km of CO2. It’s so handsome that it could even be confused for an executive Hatchback at first glance. Mazda are second only to Ford when it comes to how well their cars handle in mainstream sectors. This one is enjoyable to drive and involves you in the experience. SKYACTIV tech, which reduces weight, helps. Standard kit is good, and includes colour-specific door handles, air-con and alloys. Despite looking upmarket, it doesn’t always feel it thanks to a cramped interior. Thick pillars won’t help when it’s time to park. 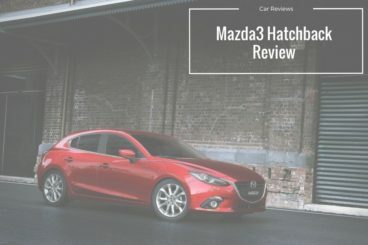 Let’s see how the car fares against its rivals in the comparison section of our 2017 Mazda Hatchback 3 review. 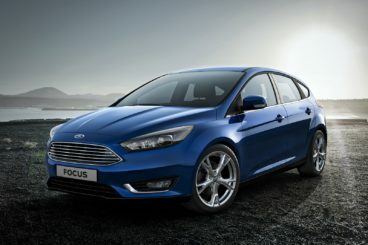 The Ford Focus is a mainstay of any buyers shortlist who are looking for a mid-sized family Hatchback. As ever, it’s stylish and great fun to drive. Ford have actually watered down its driveability this time around, which means it isn’t as sharp as it has been in the past. However, it was so good that it remains the best-handler in this market. It’s lively in bends, shifts gear with smoothness and speed, and boasts responsive controls. In terms of its engines, the only one we’d suggest you overlook is the base-level 1.6-litre petrol engine. It delivers just 83bhp, which isn’t enough to compliment the car’s drivability. We like the EcoBoost turbo 1.0-litre petrol that produces 123bhp and does 0-62 in 11.2 seconds. For more power, check out the 1.5-litre petrol engine that develops 179bhp, and does the same sprint in 8.8 seconds. The diesel range is defined by a trio of competent 1.5-litre engines and a pair of 2.0-litre TDCi’s. All offer modest performance, all feel strong, and all are relatively nippy. If you have the cash, the 2.0-litre 148bhp TDCi model is the standout one, thanks to its power. It’s economical too, and can return up to 70.6mpg. The smaller 1.5-litre diesels can return as much as 83.1mpg, while the 1.0-litre EcoBoost petrol engine is good for returns of around 58.9mpg. Inside, the Ford Focus looks presentable. Its dashboard is uncluttered, and a silver trim livens up an otherwise grey cabin. The controls for the most part feel sturdy and pleasing to the touch, though there is evidence of low-rent plastics in here, too. The entry-level and mid-range models miss out on heated leather seats and multifunction steering wheel, but all trims are comfortable and well-equipped. Visibility is good all-round, and air conditioning is standard. You need a car like this to be practical. While the Ford Focus Hatchback has its strong suits, its 316-litre boot isn’t one of them. It’s smaller than the Mazda 3 and plenty of other rivals. In fact, it’s only 17-litres bigger than the Ford Fiesta. That aside, there are plenty of additional features that make the Focus really practical. These include a reversing camera, a self-parking system, and rear and front parking sensors. Interior space is good upfront, but legroom in the rear is a bit of an issue. Storage spaces are plentiful, but we can’t help but feel that in its third generation the Ford Focus is losing its touch. The Subaru Impreza captured the imagination of many a young boy in the nineties when it became the thrilling star of racing video games. This is the family-friendly Hatchback version, and in 2017 it’s a lot more sensible than its virtual alter-ego. It looks achingly dull – and has a driving experience to match. If you remember fondly the hell-raising Impreza of video-game-fame, you’ll be sorely disappointed by how this one drives. It’s very much like a rock star who’s sobered up and doesn’t even swear anymore. It comes with just one engine, a terribly slow 1.6-litre petrol engine that takes 12.3 seconds to complete the 0-62 “dash”. Lacking a turbocharger, it feels dated. That said, the Impreza does benefit from a four-wheel-drive system that offers lots of grip. It’s just a shame, then, that Subaru couldn’t provide it with a powerful enough engine to go with it. Worse still, the four-wheel-drive system serves to bump up fuel costs. 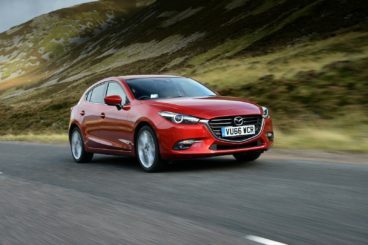 The 1.6-litre engine returns 44.1mpg at best, which is miles off what the Mazda can manage. And it’s not even as powerful. Emissions stand at 147g/km, which results in a yearly road tax bill of £145. It’s fairly cheap to insure, and occupies insurance group 13. However, the entry-level Mazda and Ford are cheaper. Inside the Impreza, things don’t really improve. The dull styling of the exterior is a sign of things to come. And although the cabin looks good on first sight, it doesn’t take long for you to notice the cracks. The plastics are cheap, the central screen is small and old – and sat nav isn’t available. That said, we do like the design of the dash. It’s smart, and the controls are well-placed. It’s just such a shame that the overall quality of the interior is poor. 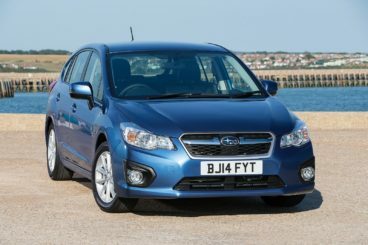 The Subaru Impreza’s biggest strength is its practicality and possibly its saving grace. It has a 380-litre boot, which is significantly bigger than the Mazda and the Ford, and interior space is good. Four adults can sit in comfort, and access is easy thanks to the wide-opening doors. Visibility is decent, and we like the fact that a reversing camera is standard across the range. Parking sensors, though, aren’t even available as an optional extra. Often the bridesmaid and rarely the bride, the Mazda 3 has played second fiddle to the likes of the Focus and the Volkswagen Golf over the years. However, we’re pleased to say that it’s, at last, caught the stuttering Ford up. Improvements include sharper handling, a quieter interior, and its undeniably handsome looks. The new Mazda 3 Hatchback is well worth a test.